Donald now worked as a cameraduck for a TV news program, usually paired with reporter Daisy on assignments. Daisy and the boys had apparently attended speech therapy classes, and they now spoke without the duck accent. Donald, of course, was as angry and unintelligible as ever. The “extreme teens” lived with their uncle in a modest suburban house, idling away their days playing video games, watching television, and hangin’ at the mall. But like any good cartoon duck, when adventure called, they answered. 4.5/5 Stars from 3 users. Please give the Cartoon Series Quack Pack a vote between 1 and five stars, with five stars being the best, 1 being a show you absolutely hate, and a three for an average show. This Series has been viewed 3 times this month, and 5,840 times total. 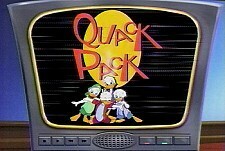 Quack Pack Episode Guide -Disney Studios @ BCDB by Big Cartoon DataBase is licensed under a Creative Commons Attribution-NonCommercial-ShareAlike 4.0 International License.